F'n Eli Manning! Bill Simmons tried to rip NYG fans this week for their irrational love of Eli Manning. As a life-long NYG fan, I'm offended. I hate Eli Manning. Always have. Since he pouted on stage at the NFL draft forcing the trade from San Diego and through every Eli Manning face caught on the sidelines, we NYG fans have endured. During his tenure, we have won two Super Bowls to which he gets some credit. 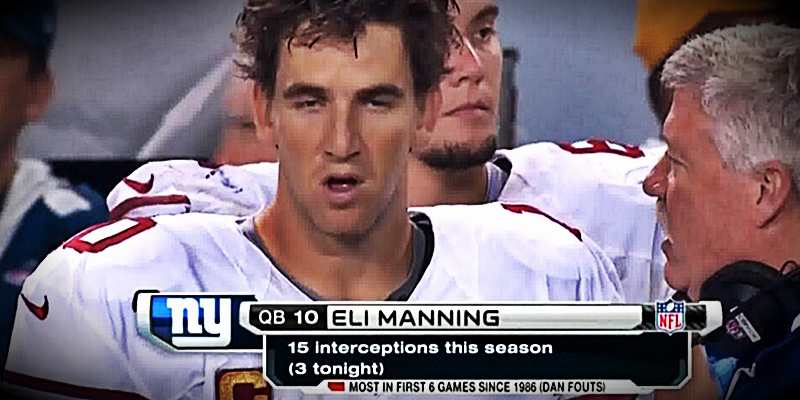 But every time he opens a game with an "Eli" (incomplete on first down followed by two sacks forcing the Giants to punt from inside the 10), I remember why I hate him. Sure he has taken some hits throughout his career especially of late behind a terrible O-line. But it almost looks like he decides immediately after a snap that a sack is coming and falls down like he's in the WWE trying to soften the blow of the hit but still make it look good for the opposing fans. Either that or he throws the ball immediately at the ground like it's burning his hands. So no Bill Simmons, not all NYG fans love Eli Manning. However, we do love that he is 2-0 against Tom Brady on the biggest stage. Eagles vs. Giants is a huge rivalry and the games are typically total sh*tshows mired by turnovers, sacks and crazy plays that would never happen in normal game. No way the Giants open the season 0-3 even with Ben McAdoo calling the plays. This line is at least 2 pts too high based on the over reaction to the Giants offense the first two weeks. Take the Giants and the 5.5, they will win straight up. All that being said, Steelers > Bears. It's that simple. Pittsburgh is the better team, by far. However, they are not the same dominant team on the road. They seem to do just enough to win in games like this, making the 7.5 to tasty to pass up. Take the Bears and hope you see Mitch Trubisky's debut in the 2nd half garbage time. Detroit is 2-0. But did they actually win both games? Of course they did, but hear me out. Week #1, the beat AZ pretty handily. However, they had nothing going at all in the first half and were actually losing 17-15 at the start of the 4th quarter. They needed 3 Carson Palmer INTs, one a Pick Six to pull out the win. Week #2 they faced off against the Giants on Monday night. Ben McAdoo's play calling and an unbelievable punt return for a TD were the breaks they needed to pull out the win. Stafford was good in the 2nd half of Week #1 and played game manager in Week #2. He won't be so lucky this week against the Falcons. Julio Jones and Mohammed Sanu will combine for over 250 yds receiving on the fast track of Ford Field. I think the Falcons hang 40+ on the Lions and get to 3 - 0. Week #2 is referred to as over-reaction week. After a long off-season and short pre-season, we usually see some crazy results in week #1 and a correction to the mean in week #2. This is week #2 for Tampa after its opener was postponed. They came out with strong win at home vs. Chicago whose week #1 performance vs. Atlanta led to everyone "wait, are the Bears actually good?". Well the answer to that was a resounding no. Sam Bradford is out again this week. Zimmer made the decision to hold out Bradford a bit earlier this week giving Case Keenum more time with the first team offense in practice. The bad news is he is still Case Keenum. This should be a defensive battle but we expect Jameis to go into Minnesota like it's Publix in Florida and steal the win like it's a bag of crab-legs. Allegedly! New Orleans has a really bad defense. No surprise. They still can't get the stink of Rob Ryan's flow out of the Superdome. Good thing they are on the road in Carolina. Even though the defense is terrible, we expect Drew Brees to do just enough to keep this division game within 3. With Greg Olsen out with a broken foot, Cam will try to do everything himself. Pre-season wonder boy Christian McCaffery needs to do something this week to justify the hype and the high draft pick I used on him in Fantasy. I don't think the Saints start the season 0-3. Carolina is 2-0 with wins against SF and BUF but those wins haven't told us anything. Always take the points in division games when it is greater than 3.5. Total trap game for Denver. I would love Buffalo if the spread was 3 or higher and make it one of my picks of the week. But those guys in the desert are pretty damn sharp making the Broncos a -2.5 favorite on the road. Short favorite on the road is always dangerous. Take Buffalo and the points, they'll probably lose 10-9. JK - not much needs to be said about this game. Cleveland is bad, but Indianapolis is worse. No Luck again this week and no luck for Pagano and the Colts. Browns showed some heart against the Steelers (cover) and played tough against the Ravens (should have covered). After getting beaten up by two "older brothers" from their division, Browns get to beat up on the weaker kid down the block. Browns get the win. Pagano gets one game closer to being the first head coach fired. Not sure Miami did enough to justify being a 5.5 favorite on the road. Good to see Jay Cutler get a win in his first game back after his short retirement. I'm ok with Cutler, not sure why everyone hates this guy. Did you not see his guest appearance on "The League" a few seasons back? The Jets would love to have Cutler throwing to their anonymous group of receivers. Really - who are these guys? Forte and Powell were both drafted in fantasy leagues, but they have done nothing so far. Expect a little bit more from that back-field this week with LB Rey Maualuga out for the Dolphins. Late score from the Jets keep this game close, making this our MeUndies "Back Door Cover" of the week. Houston's D played really well against New England in the playoffs last year. Their defensive game play gave Brady fits and they should have won the game. However, Brock "The Heist" Osweiler was playing QB for Houston. The good news, "The Heist" is no longer the Texans QB. The bad news: the Texans had to give up 2nd and 6th round draft picks to dump his $16M salary. Small price to get him off the team and get the offense moving under rookie DeShawn Watson. Watson is winner. He changes the face of the offense and the team. Watson will be able to target Hopkins often as he should be wide open all day vs. a weak NE secondary and because he gets away with a push off on every route. I like the Texans to make this a game so I'll take the 13.5 all day. I also like the Pats to trade Malcom Butler after this game - that would be so Belichick.